Forensic scientists also are known as crime scene investigators, and many who work in this career field spend their days analyzing criminal evidence. According to the United States Bureau of Labor Statistics, the majority of forensic scientists work for local or state government agencies. 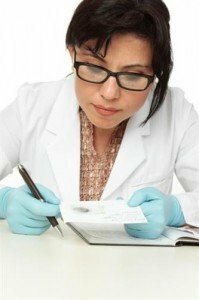 A forensic scientist might find themselves working with a police department, at a morgue, in a crime laboratory or at a coroner’s office. If you want to become a forensic scientist, note that you will not only need a quality education in a related field but you also will need to acquire work experience before handling your own cases. The best degree choice if you are interested in this field is a Bachelor’s degree in forensic science. However, many students opt to earn a degree in a natural science such as biology or chemistry. With the proper coursework and work experience, you can apply your natural science degree to this field. However, most crime laboratories and government agencies prefer a student with a broad, general education in forensic science. There are many universities and colleges that offer this particular degree, including online schools that are convenient for students to attend. The coursework that you choose during your undergraduate education is vital to your success in this competitive field. According to the Houston Chronicle, an aspiring forensic scientist should take plenty of math, science and computer technology courses, but should also enroll in English classes to hone their writing and communication skills. Classes that you might be interested in taking include pharmacology, biochemistry and criminal justice. A bachelor’s degree is required to earn an entry-level job in the forensic science industry, but many forensic scientists decide they want to specialize in a particular niche. In order to develop a specialization, you would need to earn a master’s degree or even a doctoral degree in forensic science. Specializations that you might consider include ballistics, toxicology or multimedia in the forensic science industry. In addition to providing you with the education you need in order to become specialized in a particular area of the industry, a master’s program also provides you with the opportunity to practice in actual crime laboratories. This is an ideal way to gain on-the-job experience, which is essential to landing a job as a forensic scientist. A doctoral degree in forensic science will allow you to advance within the industry and ultimately become the director of a lab. Once you have completed your educational requirements, you will need to focus on getting real world experience in the forensic science industry. Typically, this involves applying for entry level positions that are often considered apprenticeships. As an apprentice, you will work side-by-side with an experienced forensic scientist. This person will allow you to work with them on individual cases, and help you develop your analytical skills. As you work with your mentor, you will be able to explore the various specialties in the industry. At this point, you might consider a certification in a particular specialization or a training program to help you advance your skills. The best forensic scientists are considered to be composed individuals who have well-developed critical thinking skills as well as expert problem solving skills. In addition, a candidate for a forensic scientist position must possess good writing skills and be detail oriented. The average forensic scientist makes about $51,000 per year, with those in the upper 10 percent of the field earning nearly $82,000 per year. The United States Bureau of Labor Statistics reports that this career field is expected to grow by about 19 percent throughout the next decade, which is on par with many other career fields in the country.